One of the reasons why you struggle with playing guitar solos that sound AMAZING is because you have not mastered the ability to make your phrasing ‘match’ the emotion the solo is trying to express. Until you fully understand how to do this, your guitar solos simply won’t sound as good as they have the potential to sound. The good news is, it is very easy to learn how to creatively use these phrasing nuances to make any guitar solo sound better. 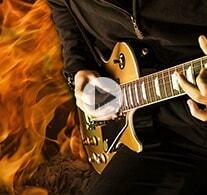 Learn how to play guitar solos that sound totally badass. Simply enter your name and email, then click the "Show Me The Video" button to enter. All information is kept 100% private and confidential.